Pantry Closets provide versatile storage for any household. These sections of your home get fuller as time goes on, yet the closet stays the same size. Pantry storage and organization is critical to maximizing efficiency. We specialize in strong, stylish shelving to match your kitchen. Sierra Nevada Closets & Cabinets knows the kitchen pantry is not just for food anymore. Pantries have become a 'catch all' for pet food, cookbooks, cleaning supplies and more. 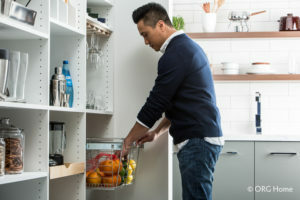 Your kitchen pantry storage should evolve as your life does with smarter shelving and storage solutions. 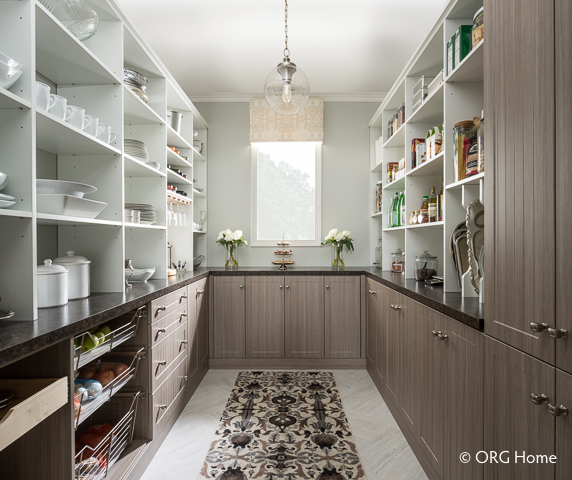 Our pantry storage design service begins with a free on-site consultation. Our licensed experts measure and identify your pantry needs and primary uses. We then use computer programming to generate 3D images of your pantry upgrade, giving you a 360 degree view of the space. This ensures your ideas come to life down to the last detail. Once we have design approval, we order and install your new cabinets and shelving. We can also expand and rebuild your pantry to improve layout and appearance. We work with you during the installation process to ensure your needs are met. We incorporate any changes you need along the way to ensure total customer satisfaction. Our cabinetry manufacturing partner, ORG Home, is the perfect complement to our locally owned and operated business. ORG Home operates in the United States, helping us bring you stylish and affordable options. Sierra Nevada Cabinets & Closets gives you access to a variety of custom products. You can count on us for smart organization, colors and styles to complement your home. From our free on-site consultation to our lifetime warranty on all products, Sierra Nevada Cabinets & Closets dedicates itself to customer service. Owner Ron Pringle conducts all consultations and oversees the design process. During installation Ron works with every client to ensure their design needs are met. This personal connection puts Sierra Nevada Cabinets & Closets a step above the competition. Our experience and passion pours into every closet we create. Trust Our More Than 25 Years of Experience! Call (775) 358-5121 For A FREE Consultation Today! Ron was amazing from the beginning. He made himself available quickly and sat with us for hours as my wife and I went back-and-forth on a TV niche and master closet layout. He’s very knowledgeable and accommodating. He stayed true to his pricing and install timing. Everything was completed within a day and a half and they both look great! Thanks for the great work here! Ron is the best! Great product AND time schedule to boot! Sincerely, I wanted to take my time to write this review to see if I would still love it in time! Yes… Yes and yes!!! Ron and his employee Edward were professional and fun to work with! Yes I made a more than a few changes along the way and he never once complained and still kept to his schedule and mine. Then I decided to have him use Forterra countertop to finish my laundry room cabinet base! Perfection! Ron was a pleasure to work with. He listened to our needs, and designed two closet systems. The job was scheduled and completed exactly as promised. Thanks Ron! Ron was great, he gave us lots of different options and took the time to find the right solution for our budget. He was professional and prompt. I recommend him for your next project. Copyright 2019 Sierra Nevada Cabinets and Closets All Rights Reserved.